Media captionNHM's Lorraine Cornish: "For us, it is one of our most important fossils"
One of the true "rock stars" of the fossil world is going on tour for the first time. London's Natural History Museum has sent its specimen of Archaeopteryx - the so-called "first bird" - to Japan. It is travelling in Asia with nearly 300 other treasures from the South Kensington institution's collections. The limestone slabs that contain the bones of this pivotal creature on the evolutionary line from dinosaurs to birds are considered priceless. They are also very delicate. But museum officials are satisfied the iconic fossil will come to no harm. "The scary thing is that it contains parts that are only one or two millimetres in depth, and so for me going to Tokyo with it is a bit challenging," concedes Lorraine Cornish, the head of conservation at the NHM. "But we're doing some exciting touring exhibitions - putting ourselves out there to promote our collections. And if you're going to do an exhibition about the 'treasures of the Natural History Museum' then you kind of have to include this fossil because it really is a treasure." Purchased in 1863 for £700 from Germany, where it was unearthed, the fossil was kept initially at the British Museum before being moved to the NHM when it opened in 1881. It has not been out of the building since - until now. The fossil is referred to by experts simply as the "London Specimen". It represents the holotype of the species. In other words, it is the version of Archaeopteryx against which all other discoveries are compared. Not that there are many. Eleven full-body specimens have been formally described; there are perhaps two or three others in private collections. Getting up close to this 150-million-year-old icon is certainly a buzz - something I had the privilege of doing as Lorraine prepared the specimen for its Asian excursion. At first glance, it might seem to be just a ragtag assortment of bones, but look closer and you immediately understand why Archaeopteryx is so interesting. It has beautiful impressions of feathers and wings - like a bird. But then it also displays the claws, the long bony tail and the serrated teeth you would associate with dinosaurs. No wonder Charles Darwin was so excited by Archaeopteryx. Emerging just a couple of years after he published his theory of evolution, this specimen was just the sort of transitional form he would have expected to exist in the fossil record. In recent years, there has been a battle of headlines over the importance of Archaeopteryx. At times, it has seemed out of favour, no longer considered to be right at the base of the line that diverges from non-avian feathered dinosaurs towards modern birds. Then some new research is published and the reputation of this magpie-sized creature is restored. But Prof Paul Barrett at the NHM says much of this to and fro is really the esoteric chatter of specialists. 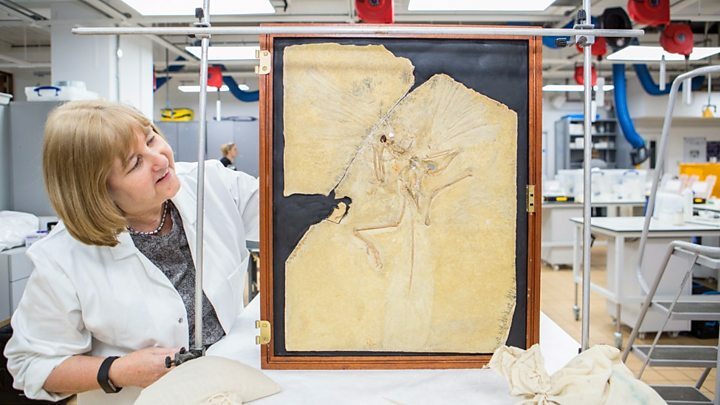 "Archaeopteryx is important because it's a nice fossil with lots of information and it was the first one recognised as an early bird, but in terms of being earth-shattering - that job is done," he told me. "Its central role has been in establishing birds as dinosaurs. That is its lasting historical legacy. "Anything that gets published on it now is more or less a tweak to that story. "There are many new fossils, particularly from China, that have come out and cluster around it on the evolutionary tree; and there are lots of arguments over which of these is going to win the ribbon as the 'earliest bird', but to some extent that's now become a much less interesting question." The London Specimen is still used in research. It was recently scanned to produce a new, soon-to-be-released, three-dimensional visualisation. This work is bound to throw up fresh insights on the creature, says Lorraine Cornish. But her main concern right now is getting the fossil safely to Tokyo and back. Japan as we all know is frequently shaken by earthquakes, and London officials have had to satisfy themselves that their fossilised "crown jewel" will be protected against any tremors. Those super-thin parts are now supported underneath by a polyethylene glycol-soaked gauze. The head of conservation told me: "We've got all sorts of measuring devices that we're taking with us to Japan, to sense vibrations and to check the temperature and humidity. And it will be very closely monitored when it's in Tokyo. And then we'll be equally careful when we bring it back." Treasures of the Natural World: Best of London's Natural History Museum will open on 18 March at the National Museum of Nature and Science in Tokyo. The travelling exhibition features all sorts of objects, including many animals that inspired Darwin directly. The artefacts range from a lion from the royal menagerie to an exquisite glass model of an octopus. All have a fascinating science backstory. "Science is a global endeavour fuelled by wonder and curiosity so it has been an ambition for us to share these extraordinary treasures with a wider audience," said NHM director Sir Michael Dixon. "They are the essence of the scientific exploration that inspired pioneers and continues today at the Natural History Museum." Other destinations beyond Japan will be announced in due course.